Democritus, the laughing philosopher, had ideas far in advance of his time. He is famous for his atomic theory featuring tiny particles always in motion interacting through collisions; his belief that the universe is governed entirely by natural, mechanistic laws rather than gods; his description of a universe containing an infinity of diverse inhabited worlds; his assertion that nothing is actually something; his deduction that the light of stars explains the Milky Way’s appearance; and his discovery that a cone’s volume is one-third that of the cylinder with the same base and height. Democritus wrote eloquently on subjects as diverse as the origin of human beings, artistic perspective, mathematics, anthropology, biology, medicine, cosmology, poetry, physics, and atomic theory. Democritus was born into a noble family in about 460 BC in the Ancient Greek city of Abdera. After his father died, Democritus used his inheritance to travel widely, educating himself both broadly and deeply. He followed in the footsteps of earlier Greek philosophers such as Thales and Pythagoras, living for some time in Egypt, whose mathematicians impressed him. On eastward travels he visited Babylon and he may have reached India. He also traveled throughout Ancient Greece before settling down again in his hometown. Democritus’ personality was calm, tenacious, and cheerful – hence the name ‘laughing philosopher.’ He believed the main goal of life should be happiness for everyone. He authored a large number of books, all now lost, and was regarded as an outstanding writer. Democritus was more interested in understanding the universe than in money. He lived simply, often seeking solitude to think more deeply about the world. Democritus believed humans originated in mud and lived at first as wild animals before slowly learning enough to become civilized. Plato, who lived at the same time as Democritus, said it was the duty of men to father children for the benefit of the state. Democritus, who did not want children, argued that people should be free to choose for themselves whether or not to raise families. Democritus regarded the freedom of the individual as more important than the needs of the state. Democritus did not believe in God or the gods, believing the world to be governed entirely by natural laws. This may be one of the reasons his works perished in later years. Democritus lived a long life, probably 90 years. Some ancient sources claim he lived longer: the third century AD Greek biographer Diogenes Laërtius said Democritus lived for 109 years. None of Democritus’ many works have survived intact. Fragments exist, and some of his ideas were discussed by other Ancient Greek philosophers, particularly Aristotle, who gave us some details of the atomic theory. Aristotle opposed the idea of atoms, believing that matter did not exist as discrete units, but was continuous. The Greek word atomos means uncuttable. Atoms are the smallest particles of matter – too small for us to see, although larger ones could exist. Atoms are indivisible – they can never be cut into smaller particles. Atoms are separated from one another by the void – a vacuum or empty space – which allows them freedom of movement. Atoms have been in motion forever and will remain in motion forever. Atoms pass movement between one another by collisions. Atoms are infinite in number. Atoms have an infinite variety of shapes and sizes, leading to atoms of different substances having different properties. Substances differ according to the shapes, position, and groupings of the atoms they are made of. There is an infinite number of elements, not merely the earth, air, fire, and water described by Empedocles. Atoms can link to one another – for example via convex and concave shapes of individual atoms allowing them to slot into one another. Objects we can see are made of aggregations of linked atoms. Visible changes are caused by rearrangements and movements of atoms. From a modern scientific perspective many of Democritus’ statements about atoms are incorrect or flawed. They are also undeniably profound and indeed brilliant – Democritus explains the whole universe using a theory of microscopic particles. His idea that atoms are always in motion is both correct and exceptional. No better explanation of matter was produced until the nineteenth century. Albert Einstein’s 1905 mathematical model, which explained Brownian motion as the collision of particles. 2,300 years earlier, Democritus had described the interactions between particles as collisions. Ernest Rutherford’s gold leaf experiment in 1909, which proved that matter exists in tiny lumps. With remarkable insight, Democritus recognized that nothing (the void or vacuum) is actually something. If his argument had ever made the conceptual leap into Ancient Greek mathematics, it would have been a revelation, eliminating one of its major handicaps i.e. a number system that did not recognize the existence of zero. In Ancient Greek texts about atomic theory, Democritus is often mentioned in tandem with his teacher Leucippus. The modern consensus is that we owe the original atomic theory to Leucippus, while Democritus took the bare bones of the theory and developed it into the one outlined above. 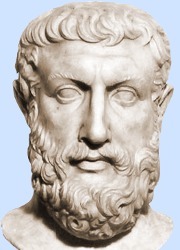 Leucippus and Democritus and later philosophers, such as Epicurus, are described as atomists. We know even less about the life of the Ancient Indian philosopher Kanada that we know about Democritus. Kanada’s atomic theory was conceived over two millennia ago. The theory was written in the Kanada sutra, a work believed to have been compiled sometime in the period of the sixth to the second centuries BC. Scholarly opinion is that Kanada’s atomic theory evolved independently of Democritus’. Kanada said that matter could not be divided forever. At some point the smallest units – he called these parmanu – would be reached. The parmanu clump together in different ways to make the different types of matter we see around us. Kanada wrote that there are four types of atom: air, earth, light, and water. Color, smell, taste, and touch are distinct from atoms – they are examples of properties of substances. Democritus, however, believed the behavior of atoms is responsible for everything, including such things as color and taste. Why Devise an Atomic Theory? That ‘which is not’ does not exist. For change to happen, something must both exist and not exist at the same time. This is impossible. Hence change can only take place if something new appears. For something new to appear, something must be created from nothing. This is impossible. Hence change is impossible – it is an illusion created by our flawed senses. Democritus/Leucippus responded to this with atomism: atoms and the void had always existed; atoms could move and collide in the void and could form aggregates, hence change could happen. Therefore, change is not an illusion created by our senses – our senses detect changes in the atoms and the void. Democritus believed time and atoms had no beginning. Everything we see is created by collisions and aggregations of atoms. In Meteorology, Aristotle tells us Democritus believed the Milky Way is made up of the light of stars seen at night when the sun’s bright light does not obscure their weaker light. This is a remarkably accurate deduction in a time when most explanations of the Milky Way were uninformative or shrouded in myths. In the early 1600s, Galileo pointed one of the earliest telescopes at the Milky Way and discovered that Democritus was right. The Greek word for the Milky Way is galaxias, which gave us the English word galaxy. In his work Refutation of All Heresies, the Christian theologian Hippolytus of Rome (170 – 235 AD) relates Democritus’ interpretation of the universe – a place with an infinity of different worlds, some of them inhabited; some worlds prospering, others declining; some with water, others with none. 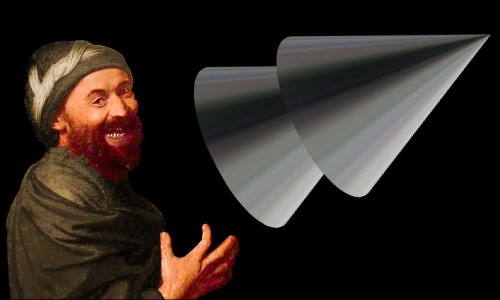 Archimedes then tells us these results were soon proved by Eudoxus, who was born during Democritus’ lifetime. Other than this, we know Democritus authored works such as: On Geometrics, On Irrationals, On Mapping, On Numbers, On Perspective, and On Tangencies. Democritus did not believe humans had any special place in the universe and believed everything had a natural cause – there were no gods to intervene or create anything. "Democritus." Famous Scientists. famousscientists.org. 6 Aug. 2018. Web.